The most expensive parts of a wind turbine alternator are the magnets and the enamelled magnet wire. In a previous article we have introduced cheap and easy to make PVC wind turbine blades. Here you will learn how to obtain magnets for free and put them to good use in a wind turbine generator. Extracting the magnets from an old hard drive is very easy – usually just a small selection of screwdrivers is required. Each magnet you remove from a hard drive will still be attached to a steel backing plate which should be removed. This can be difficult – the easiest way is to put one corner of the backing plate into a bench vice and bend the other corner of the plate using a pair of vice grips. The following short video shows the full process from opening the hard disk drive, extracting the magnets on their backing plates, to removing those backing plates to leave just the magnets ready to be used. WARNING! Sometimes the magnet will break instead of coming away from the backing plate. Ensure that any pieces of broken magnet are kept well out of the reach of children since a couple of swallowed pieces of magnet sticking together in the intestine could be fatal. 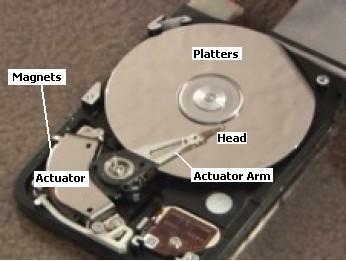 The magnets used in hard disk drives are very strong neodymium (rare earth) magnets. 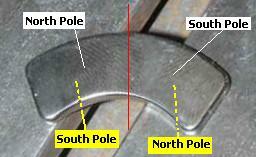 Typically a magnet will have a north pole on one face, and a south pole on the other face. Hard drive magnets differ in that they act like two magnets stuck together side by side. On one face there is a north pole on the left and a south pole on the right, on the other face there is a south pole on the left and a north pole on the right. This is shown in the image below with the white labels pointing to the top face of the magnet, and the yellow labels pointing to the (hidden) bottom face of the magnet. Therefore, in using these magnets to make a wind turbine alternator you have two choices. The first is to cut each hard disk magnets in half (using a non-magnetic cutting disk) to make two standard magnets with one entire face a north pole and one entire face a south pole. Alternatively they can be used as is, but the coils in the alternator must be sized to straddle just one pole at a time. 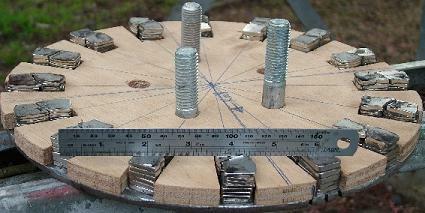 However you decide to use them, the power of the magnets can be increased by sticking them together (as shown in the photograph above of five magents stuck together). Three magnets stuck together for example should give somewhere between 2 and 3 times the magnetic power of just one magnet.